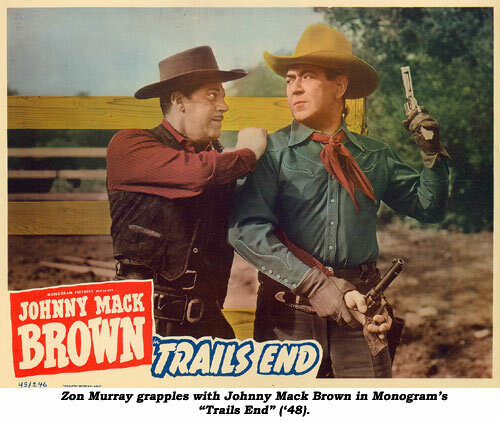 Big, mustached, rugged and intimidating looking with his Stetson always worn in a half-cocked manner, Zon Murray played virtually nothing but nasty western heavies during his 20 year screen career which began with Monogram’s “Lonesome Trail” in 1945 opposite Jimmy Wakely. Born Emery Zon Murray April 13, 1910, he capitalized on his unusual middle name, making it a very memorable screen moniker. Both of his parents, Franklin Lafayette Murray and Dora Edwards, were natives of Missouri. The Murray family migrated from Missouri to California as many people did in the ‘30s. Zon labored as a carpenter, specializing in building swimming pools, before he got into pictures, as well as after. Pierce remembers Zon being a jack-of-all-trades. He said Zon built a home in Laurel Canyon all by himself. The house included everything, even a pool. Lyden also recalls Murray was a lot of fun. He and his wife even served as foster parents for some boys after the Murray’s own children left home. Actually, before the Wakely film, Zon played two small uncredited parts in two serials, “The Secret Code” (‘42 Columbia) and “Secret Agent X-9” (‘45 Universal). The time gap between the two and the years indicate possible military service. 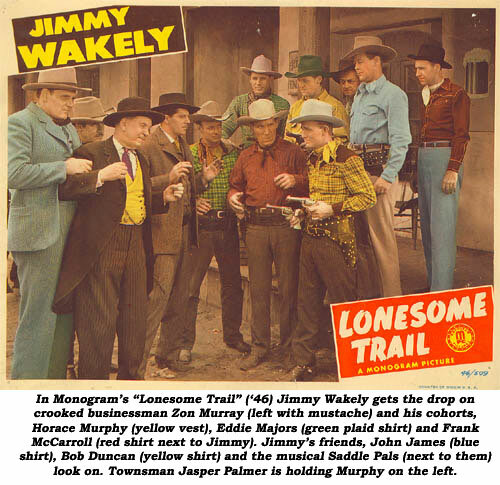 At any rate, with the Wakely film his badman screen persona was in constant view opposite Sunset Carson (“El Paso Kid”), Buster Crabbe (“Ghost of Hidden Valley”), Kirby Grant (“Gunman’s Code”), Charles Starrett (“Terror Trail”, “Fighting Frontiersman”), Eddie Dean (“West To Glory”), Russell Hayden (“Trail of the Mounties”), Johnny Mack Brown (“Code of the Saddle”), Roy Rogers (“Grand Canyon Trail”), Hopalong Cassidy (“False Paradise”), Lash LaRue (“Son of a Badman”), Whip Wilson (“Outlaws of Texas”), “Rocky” Lane (“Night Riders of Montana”), Bill Elliott (“The Longhorn”), Rex Allen (“Border Saddlemates”), Gene Autry (“Barbed Wire”), Clayton Moore (“The Lone Ranger”)—and others with the same stars. 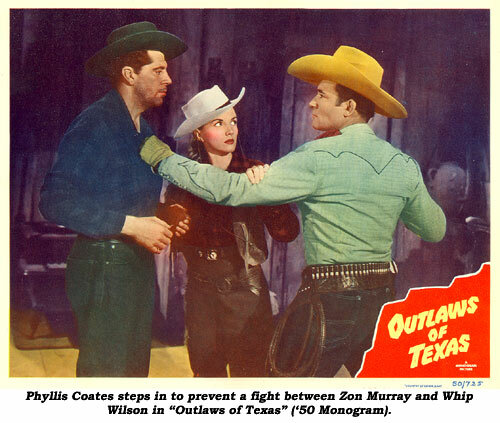 Zon also managed good roles in several A-westerns as well— “Dallas” (‘50), “Along the Great Divide” (‘51), “Blood On the Moon” (‘48), “Carson City” (‘52), “Powder River (‘53), “Calamity Jane” (‘53), “Passion” (‘54) and his final fling, producer Alex Gordon’s “all star roundup”, “Requiem For a Gunfighter” in ‘65. 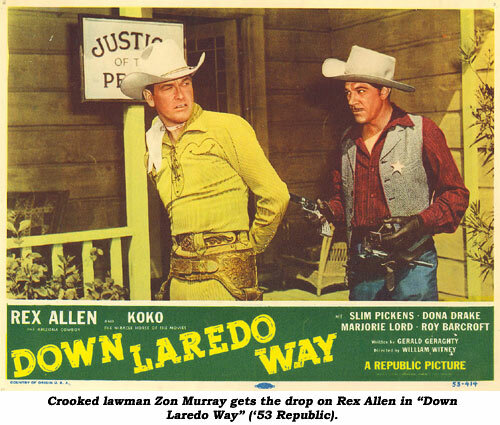 For TV Zon matched wits and punches with our heroes on “Cisco Kid” (12 eps. 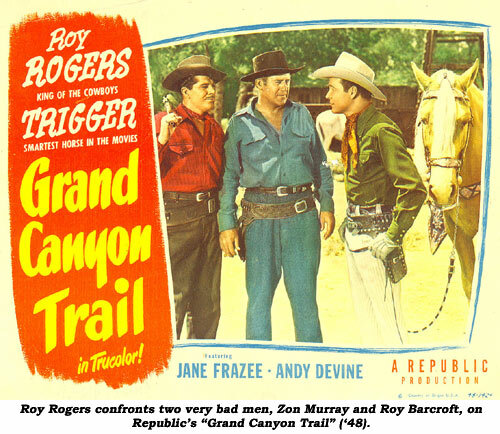 ), “Kit Carson”, “Lone Ranger”, “Bronco”, “Bonanza”, “Roy Rogers”, “Hopalong Cassidy”, “Gene Autry”, “Stories of the Century”, “Wyatt Earp”, “Maverick”, “Colt .45”, “Broken Arrow”, “Casey Jones”, “Cheyenne”, “Deputy”, “Have Gun Will Travel”, “Laramie”, “Lawman”, “Wild Bill Hickok”, “Rin Tin Tin”, “Sgt. Preston” and others. Zon also worked in six latter day serials for Sam Katzman whom he reportedly wasn’t fond of due to his cheapness. According to Zon’s great nephew, Zon (like most men who played heavies) had a completely different nature off screen—where he was fun and outgoing. Having acquired some property on Laurel Canyon in the ‘40s, he put his carpentry knowledge to use in the ‘60s to build a second house on the acreage which he rented out. Unfortunately, he wound up renting to some rock groups who trashed his property. Murray was married to Dorothy J. Sands and they had two sons, Gary Zon Murray and Rickey Murray. Some reports indicate Murray died in his armchair after having finished lunch on March 2, 1979. Fact is, according to the official California death certificate, Murray died April 30, 1979, of acute myocardial infarction due to atherosclerotic heart disease at Desert Hospital in Palm Springs, California. He was 69. Murray’s remains were cremated and placed in Forest Lawn Memorial Park in Glendale, California. The movie camera responded to Zon’s unique brand of nastiness—as did we the viewers—and thankfully we have it all to watch and recall on film and video.